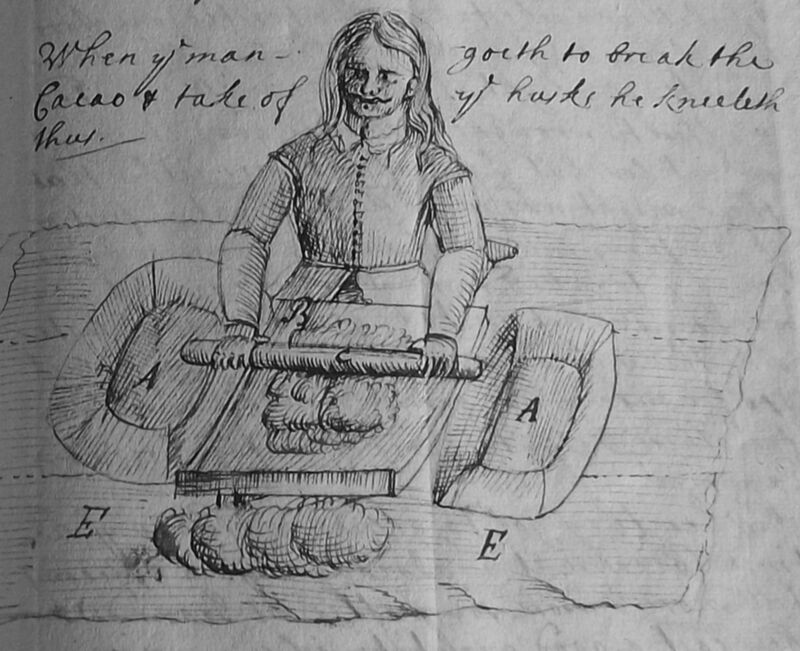 Dr. Kate Loveman, English lecturer at the University of Leicester, has found some early English chocolate recipes in the journal of Edward Mountagu, the first Earl of Sandwich, great-great grandfather of John Montagu, the fourth Earl of Sandwich, credited with inventing the fine foodstuff that bears the family title on far thinner evidence than recipes written in his own hand. The most complete recipe is for a frozen chocolate product — a 17th century frappé, if you will — and in an age when freezing was still a subject of extensive scientific study rather than the subject of cookbooks, Sandwich’s frappé may be the earliest English recipe on record for an iced chocolate treat. Waked in the morning with my head in a sad taking through the last night’s drink, which I am very sorry for; so rose and went out with Mr. Creed to drink our morning draft, which he did give me in chocolate to settle my stomach. The Earl of Sandwich was one of Pepys’ patrons. He is often mentioned in the journal, so Loveman decided to follow up by reading the unpublished manuscript of Montagu’s journal. She found a 30-page section dedicated to chocolate written in 1668 after the Earl returned from serving as England’s ambassador to Spain. From Spain, chocolate spread to France where its trade became a state monopoly and only the aristocracy were allowed to indulge. Louis XIII’s wife Queen Anne of Austria, daughter of King Philip III of Spain, was an avowed chocolate lover. When she married Louis in 1615, she ensconced the fashion for chocolate in the highest echelons of French society. England came to the chocolate game a few decades later, first through translations of a 1631 book about chocolate written by Spanish doctor Antonio Colmenero de Ledesma which were published in the 1640s and in 1652. The title page of the 1652 translation notes that the chocolate described in the volume could be purchased “at reasonable rates” from bookseller John Dakins in Holborn. 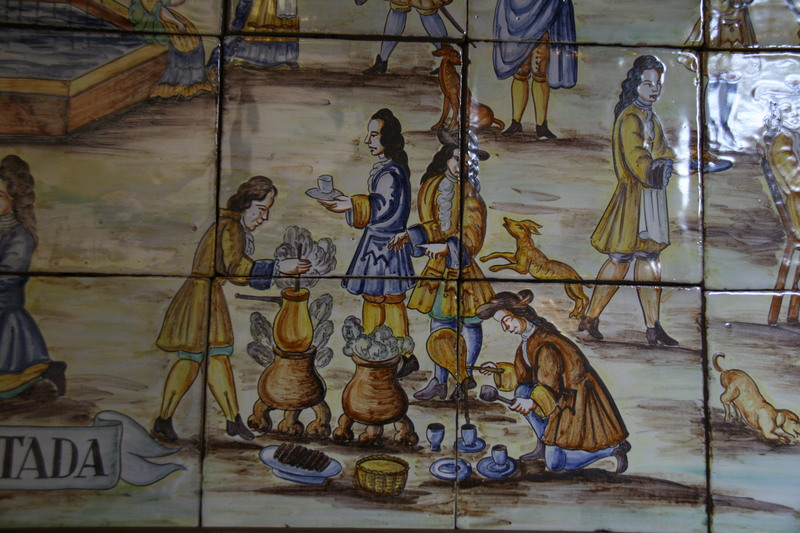 Booksellers often sold medicines and nostrums at this time, which is how chocolate got on the menu. In Bishopsgate Street in Queen’s Head Alley, at a Frenchman’s house, is an excellent West Indian drink called chocolate, to be sold, where you may have it ready at any time, and also unmade, at reasonable rates. The Earl of Sandwich’s 30 pages leans heavily on Spanish expertise. He includes Colmenero de Ledesma’s instructions on how to prepare chocolate, plus 10 pages from a spy in Madrid who reported on the Spanish manufacturing process. First the nuts were dried and ground, then sugar and spices (chile peppers, cinnamon and aniseed were the favorites) were ground separately and then cooked together. This produced a thick paste that would keep for a long time once hardened. The Spanish would add hot water to the paste and whip it, adding more water and sugar to taste. The result was a thick, sludgy beverage that even with the sugar was still bitter (it takes an enormous amount of sugar to de-bitterize chocolate, as anyone who has tried to make hot chocolate straight from cocoa powder has learned the hard way). Montagu collected all this information with a political aim, not just out of personal interest. Cromwell’s Navy had taken Jamaica from the Spanish in 1655, and there were lots of cacao plantations in Jamaica. As ambassador to Spain, Sandwich had signed a new commercial treaty with Spain cementing the status of Britain’s new West Indian territories. Now England had reliable access to the raw materials of chocolate-making, a rich potential market for the restored Crown. 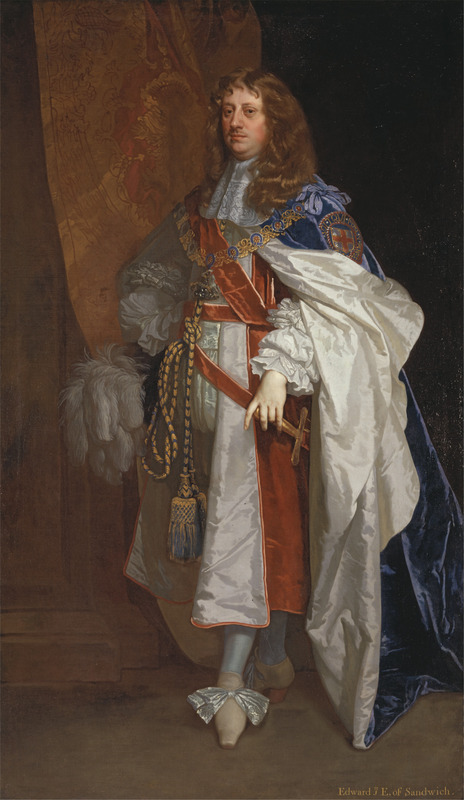 Upon his return to England, Montagu was appointed to the Privy Council’s committee for trade and foreign plantations, so his research was relevant to his job as well. Mmm… Civet musk… That sounds like something out of the Futurist Cookbook. I dearly hope the King didn’t actually pay £200 for that. The recipe for the frozen chocolate is considerably more appetizing, and it utilizes what was then the cutting edge research of Robert Boyle who had experimented with freezing and published New Experiments and Observations Touching Cold in 1665. It was Boyle who found that adding salt to snow was necessary in order to freeze liquids placed inside a vessel which would be in turn placed inside a container of salted snow. Prepare the chocolatti [to make a drink] … and Then Putt the vessell that hath the Chocolatti in it, into a Jaraffa [i.e. a carafe] of snow stirred together with some salt, & shaike the snow together sometyme & it will putt the Chocolatti into tender Curdled Ice & soe eate ^it with spoons. I’ll take that over the musk chocolate any day. The concept of frozen beverages didn’t catch on in England right away. Ices were popular already in Italy, but in England they were considered dangerous to the health. Sandwich made a point of noting of how to counteract this chilling effect: “one is oblidged for better security to Drinke Hott chocolatti in 1/4 of an houre after.” Then wait another hour before going in the water. Dr. Loveman made the Curdled Ice herself and she said it was like a very thick frappucino minus the dairy. This entry was posted on Friday, August 30th, 2013 at 11:53 PM	and is filed under Modern(ish). You can follow any responses to this entry through the RSS 2.0 feed. You can skip to the end and leave a response. Pinging is currently not allowed. I’m glad they didn’t name the chocolate concoction for the Earl of Sandwich; we would have a totally different concept of what a sandwich is! And, we’d have to make up a new name for the bread and meat one. I guess Italians liked iced chocolate better than English did for the same reason Alabamians like iced tea better than people in New England do — Italy is warmer than England is. The last recipe does sound good! Bingo. It is warmer and it has easy access to snow and ice thanks to the handy Alps and Apennines. The perfect combination for making icy foods and beverages. What a great post, many thanks. I have created a link to my post called Chocolate, Tea, Coffee I (and 2). Alas I spent far more time on tea and coffee than I did on Chocolate. How super that King Charles II and Sandwich discussed chocolate together. It makes it all more above-board somehow, specially since kings occasionally tried to close the coffee shops down. That they did, when they weren’t busy trying to establish monopolies on the trade. Wonderful post, Hels! May I suggest a chocolate sandwich? Toast two pieces of good bread, lay a slice of best chocolate between them as soon as they come from the toaster. Eat. Enjoy. This must be a thin piece of chocolate, no? Otherwise it will barely soften with only the heat of toast to work on it. How about a chocolate, toasted marshmallow, and graham cracker sandwich? Call it a S’More! Now why hasn’t someone thought of that before now? Genius! Pepys ‘mentions [chocolate] repeatedly’: really? 5 times in 9 1/2 years: very repetitious! Yes really. I wasn’t suggesting his writings were repetitious, simply that Pepys referred multiple times to enjoying a chocolate beverage. Nos parece muy interesante el articulo.